The third instalment of Doctor Who is full of new thrills, new laughs, new heartbreak and some terrifying new monsters. 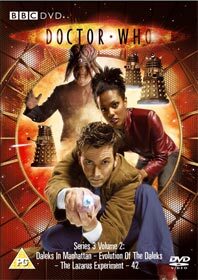 From the moment the Doctor walks into the life of medical student Martha Jones he changes it forever. In Elizabethan London, they meet William Shakespeare at the Globe Theatre while back in present day London 76-year-old Professor Lazarus recaptures his youth with consequences that threaten Martha's entire family. And, the Doctors sworn enemies, the Daleks, who have been hiding in 1930s New York, return with a terrifying plan for humanity.